Today, we’ve announced a new link up that means that when using our service to plan your next trip you can not only find the perfect trail to walk, cycle or ride, but also find & book nearby accommodation from the wide range of properties offered via LateRooms.com. This new step really does make ViewRanger, the one stop solution for outdoors adventures. 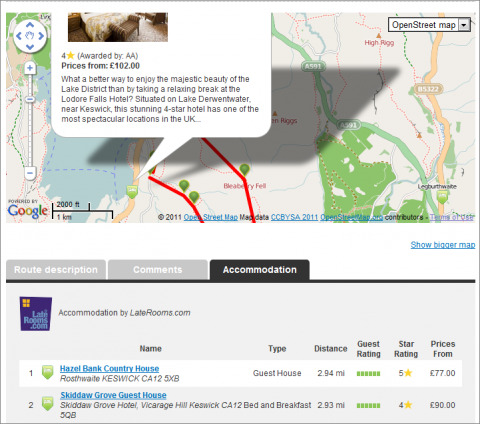 Access to accommodation booking is via a new easy-to-use tab on the routes pages of my.viewranger.com. By clicking on the accommodation tab, which is available whenever you view a route on the system (see image), you will be presented with a list of hotels, guest houses & b&b’s in the locality. We’ve also marked the location of each on the map. You can then click through to LateRooms.com to check pricing and availability for the dates of your planned trip, then book the one that meets your requirements. The accommodation service is also available via the ViewRanger App on your mobile, as from today you’ll find a new link included within the details of any planned route that you have downloaded. Just like the tab on My.ViewRanger, the link launches* an accommodation search for the location of the route on LateRooms.com. LateRooms.com have a massive portfolio of overnight accommodation to book from in the UK and in many European destinations including Italy, Spain, France, Greece, Portugal & Czech Republic and reputation for great value, which means we are confident that their service can offer a good deal nearby.